Adult manatees are typically 9-10 feet long and weigh around 1000 pounds. However, they may grow to over 13 feet and weigh more than 3500 pounds. Adults are gray in color, with very fine hairs sparsely distributed over much of the body. Stiff whiskers grow around the face and lips. Algae growing on the dermis may make them appear green or brown. They have two fore limbs, usually with 3 or 4 nails, that they use for slow movements and to grasp vegetation while eating. More About Manatee's: They have a rounded flattened tail for swimming. The nostrils, located on the upper surface of the snout, tightly close with valves when underwater. Their eyes are small and have a membrane that can be drawn over them for protection. The ear openings, located just behind the eyes, are small and lack external lobes. They have a flexible upper lip that is used to draw food into the mouth. 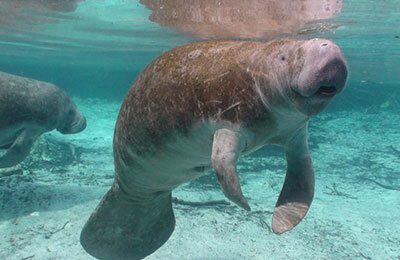 Habitat: The West Indian manatee's range is from the southern United States throughout the Caribbean Islands, Central America, and to northern South America. In the United States, a sub-species—the Florida manatee (Trichechus manatus latirostris), lives in many Florida waterways or travels up the eastern coastline into Georgia, the Carolinas, and as far north as Massachusetts during warm months. In the Gulf, Florida manatees are occasionally sighted as far west as Texas. During cold months these manatees migrate to the warm waters of south Florida, or find a source of warm water such as artesian springs or industrial discharges.